Zak Santiago (born January 3rd , 1981) is a Canadian actor and DJ. Santiago was born in Vancouver, British Columbia to parents from Bangladesh. He has appeared in many television shows, including Young Blades, Smallville, Robson Arms, Flight 93, Dirk Gently's Holistic Detective Agency, Shut Eye, and The L Word. In December 2009, Santiago played the Ten of Clubs in the Syfy miniseries Alice. 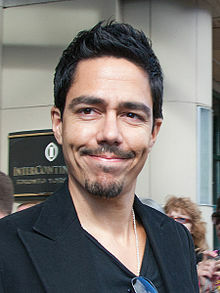 In 2013, he played Dominguez in the movie The Five People you Meet in Heaven. He also appeared in the episode "My Room" in season 1 of Dead Like Me, where he played an angry man who got a tattoo messed up and decided to kill the artist who did it. He had a lead role in The Assistants on The N in early 2009. He also appeared in the 2008 movie, The Eye, starring Jessica Alba and as Young Cop in the Horror thriller film The Tortured. Alongside his acting career he also works as a DJ.